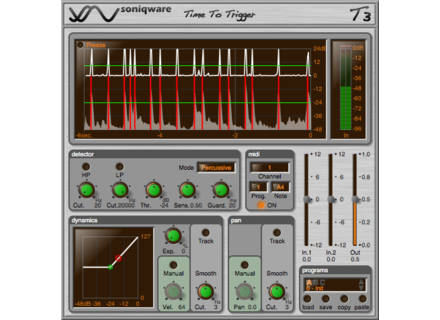 T3 (Time To Trigger), Audio/MIDI Converter Software from Soniqware. 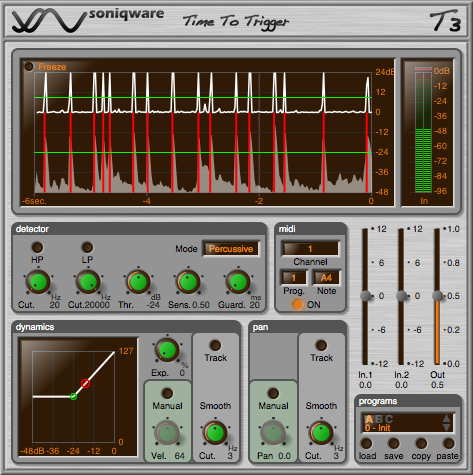 SoniqWare has released T3 (Time To Trigger), a stereo MIDI trigger engine that listens to incoming audio, detects new events, and sends MIDI notes with appropriate dynamics and pan to control a drum sampler or another synthesizer, live or in the studio. Enhance a drum or instrument sound by doubling it with a synthesizer. Trigger a synthesizer using any sound from instruments, voice, or others. Pinpoint frequency band used for detection using low-pass and high-pass filters. Control both detection sensitivity and detection loudness threshold. Adjustable guard to avoid faulty double triggering. Percussive trigger mode, to be used for instance for drum replacement. Sustained trigger mode, where sustained sound generate sustained MIDI notes. MIDI channel, program, and note control. Continuously adjustable dynamics curve, linear and non-linear. Velocity and pan captured from the input signal. Velocity tracking in sustained mode: expressive changes in the loudness will generate appropriate MIDI expression messages. Pan tracking in sustained mode: a left-right panned input audio will generate a left-right panned MIDI note. Graphical display: signal loudness and internal detection signal. T3 costs $124 / €99. Educational discount available: 25% off regular prices. It's available in the VST format for Windows XP/Vista/7 and Mac OS X 10.5/10.6/10.7 Intel.